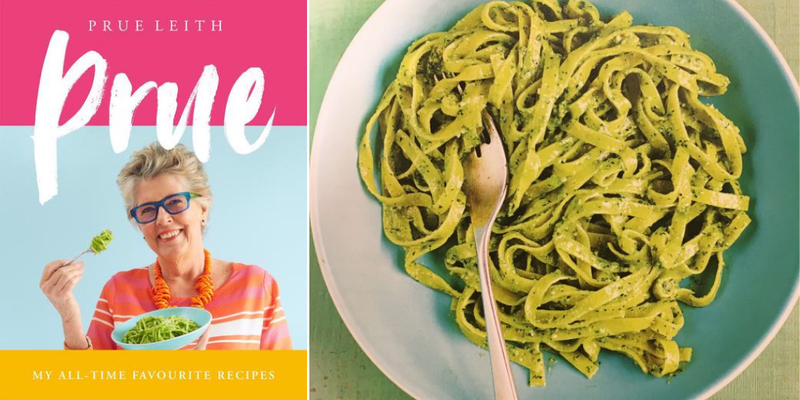 Prue Leith made this past el pesto with her nephew, Sam Leith. They made it up as they went along and were both surprised at how delicious it was. 1. Heat a large pan of salted water over a medium heat. Once bubbling, add the tagliatelle and cook for 8-10 minutes (or 2-3 minutes for fresh pasta) until just al dente. Frain, rinse under hot water and leave in the colander to steam dry for a minute before returning to the pan. Stir through a little olive oil to prevent the past sticking together. Set aside. 2. While the past is cooking, make the pesto. Put the parsley, fresh walnuts and garlic into a large liquidizer or food processor and blitz till smooth. Then add the Cheddar and blitz some more. Finally, gradually pour in the rapeseed oil as you continue to pulse until it looks like pesto. 3. Stir through the tagliatelle and serve immediately, seasoned with salt and black pepper. Prue’s tip: As with classic basil pesto, you can make the sauce a day or two in advance and keep it in the fridge. But after a day or so it begins to lose its marvellous vivid green. It’s advisable to have all the ingredients ready on hand so you can easily make it while the pasta cooks.